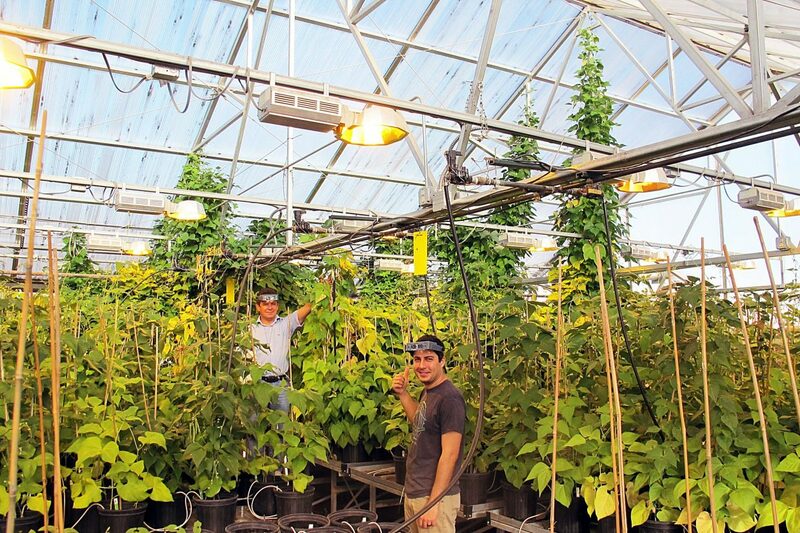 It looks like a jungle this spring in the greenhouse used by Carlos Urrea, dry edible bean breeding specialist at the University of Nebraska-Lincoln Panhandle Research and Extension Center, and his crew. About 800 different dry bean varieties, planted in December in individual pots, are growing like crazy — far above the typical height in Panhandle bean fields. Some are 18 to 20 feet tall, vining their way up wood dowels, twine, and into the greenhouse ceiling structure. In this case, Urrea and his technician Eduardo Valentin Cruzado are increasing the number of seeds so they can be used in a study being conducted by the newly established Nebraska Food for Health Center, which emerged from the "Gut Function Initiative" in the UNL Department of Food Science and Technology. The study will assess the effects of genetic diversity in common beans on the human gut microbiome, using an initial in vitro screen of the gut microbiome phenotype to define candidate bean lines that will ultimately be tested for health and wellness characteristics in animals and humans, according to the director of the NFHC, Andrew K. Benson, Food for Health presidential chair. Benson said work is still at a very early stage in the project, and the NFHC only has pilot data from 10 lines tested across microbiomes from 24 human subjects. 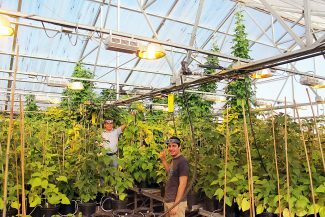 The 800 lines that Urrea and his crew are bulking up individually in the Scottsbluff greenhouse will be the first large-scale genetic analysis of these "Microbiome Active Components" (MAC traits) that has ever been done in dry beans, he said. Benson said the Food for Health Center also is in the midst of doing similar testing across diversity panels of maize, sorghum and soybeans (also the first time this has ever been done). "Since we are pioneering this innovative approach to discover relationships between plant genetics (nutrient content), the microbiome and health/wellness, we won't have any real results worth broadcasting until completion of the large-scale studies this coming fall."